Brett Wetterich blasted out of a bunker at No. 10 yesterday on his way to sharing the second-round lead at the Masters. AUGUSTA, Ga. » The only survivors to par through two days at the Masters are hardly the players anyone expected to see. Equally mysterious is Augusta National. Not since 1999 has the course been this fast and frightening, and that was before an extra quarter-mile of length. And while it's not unusual to have a Masters rookie like Brett Wetterich or a scrappy, short hitter like Tim Clark atop the leaderboard going into the weekend, rarely has this tournament been so wide open. "We're all going to have to grind," Tiger Woods said. "Birdies are very hard to come by right now." Sometimes, even making par is no bargain. Wetterich three-putted for bogey twice over the final four holes for a 1-over 73, the first rookie in the lead at the halfway point in six years. 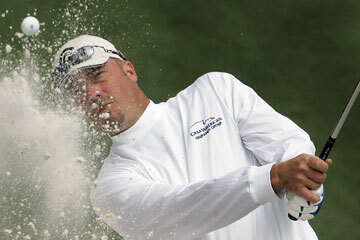 Clark overcame a double bogey at No. 5 by holing a par putt from the fringe on the 18th for a 1-under 71. They were at 2-under 142, the highest 36-hole score to lead the Masters in 25 years. One shot back was Vaughn Taylor, who grew up in Augusta and was poised to join the leaders until missing a 5-foot par putt on the final hole, giving him a 72. So much for that "Tiger & Phil" show at Augusta National. Woods and defending champion Phil Mickelson, who have won five of the last six Masters, had to scramble just to stay in the race in this one. And forget that notion that only a dozen or so players are capable of winning. Heading into the weekend, the green jacket was up for grabs, with two-thirds of the field making the cut and almost half of them within seven shots of the lead. Woods only dropped one shot from his two water balls on the 12th and 13th, made birdie from well behind the 15th green and somehow escaped with a 74, leaving him at 3-over 147 and among 22 players within five shots of the lead. "Yesterday, I threw away a good round," Woods said. "And today I salvaged a bad one." Another shot behind was Mickelson, who worried about missing the cut when he was lost in the forest left of the 11th fairway. He managed to limit the damage to a bogey, played mistake-free over the final four holes for the second straight day and shot 73. "I think anybody who made the cut actually has a realistic chance," Mickelson said. "With the wind blowing the next two days like it's supposed to, I think over par is going to win. If you made the cut and shoot in the 60s, you're right back in it." Sixty players made the cut at 8-over 152, the most to advance to the weekend since 61 in 1993.